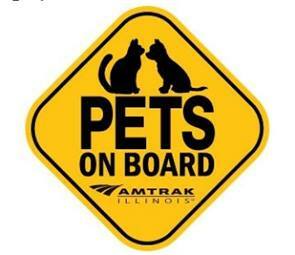 Amtrak and the Illinois Department of Transportation are launching a pilot program allowing travelers to bring their pets along on trains between Chicago and Quincy, Ill.
For a fee of $25, dogs or cats up to 20 pounds each will be accepted in carriers such as those used in airplane cabins and placed at the feet and under the seat of each pet owner. The six-month pilot program, running May 5 through Nov. 2 on Illinois Zephyr and Carl Sandburg trains, is scheduled to be continuously reviewed. 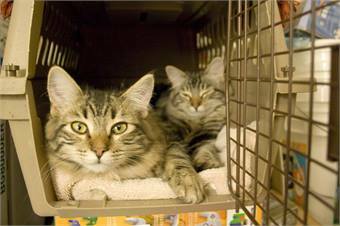 Amtrak allowed pets on board in the 1970s but only in baggage cars that had no heating, air conditioning or ventilation. The service was discontinued after less than 10 years, according to Amtrak spokesman Marc Magliari in a Chicago Sun-Times report. Amtrak routinely welcomes service animals on trains at no charge and that policy is unchanged.